I was doing some reading for my health and nutrition class when I came across this paragraph. It seemed pretty relevant considering I do live in (or near, at least) Boulder, Colorado. And it’s true, Boulder is a particularly health conscious place to live and it’s relatively easy to live a healthy life here. 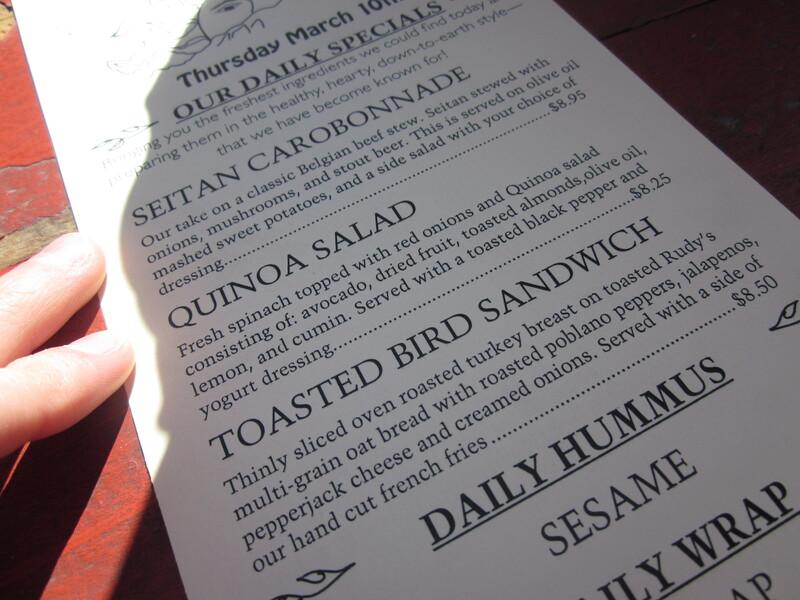 My sister and I went to Southern Sun for lunch, where healthy vegetarian options are in abundance. 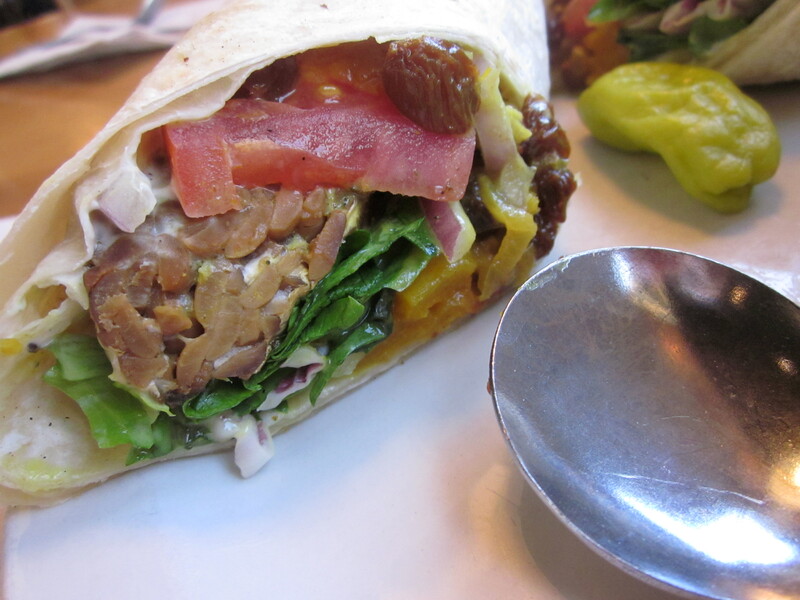 You can’t just go anywhere and find seitan, quinoa and tempeh on the menu. But in Boulder, you can! Note that this paper tried to fly out of my hand and off of the balcony about 3 times. I guess that’s the price you pay for sitting outside. 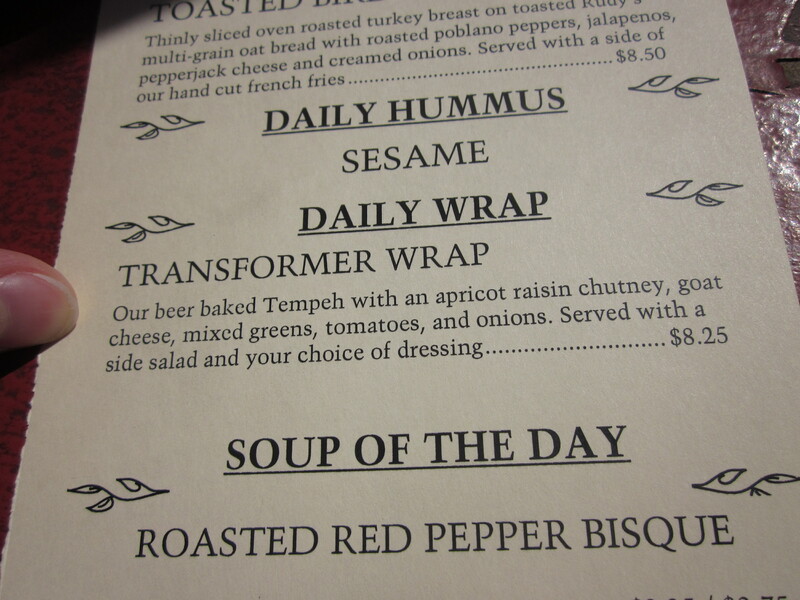 I went with the daily wrap which happened to be of the tempeh variety. Score! 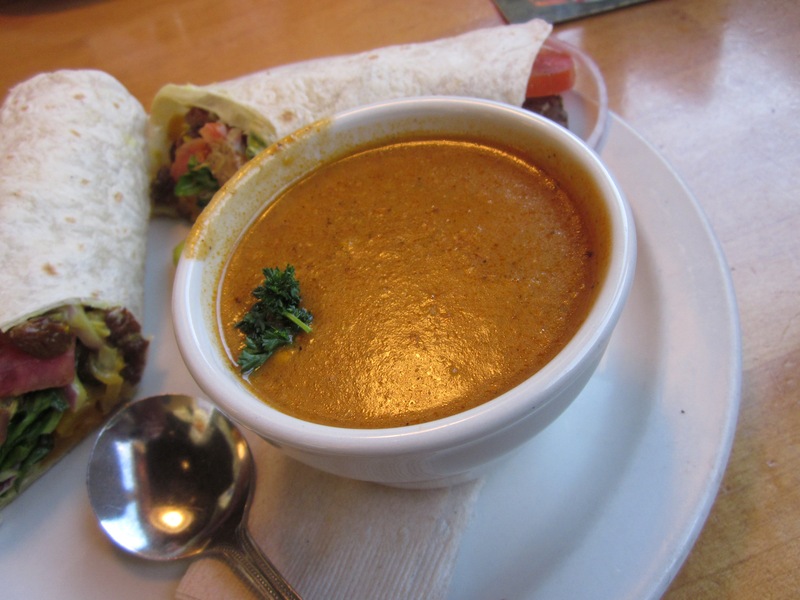 Are you eyeing that roasted red pepper bisque? Me too, which is why I subbed soup for my side salad. Then we enjoyed some mountain views while waiting for our food. They are seriously right there. 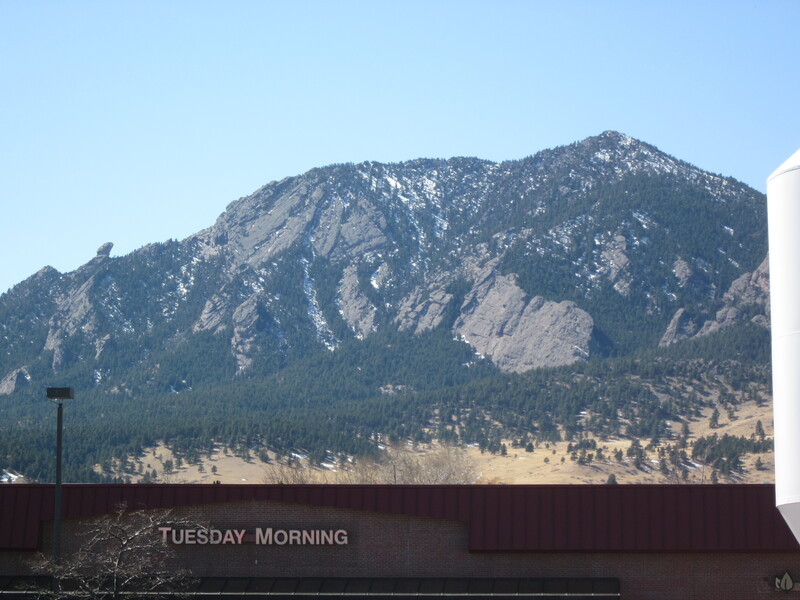 Ignore the store sign below the mountains — I have no idea what kind of store “Tuesday Morning” is. Hello, lover. 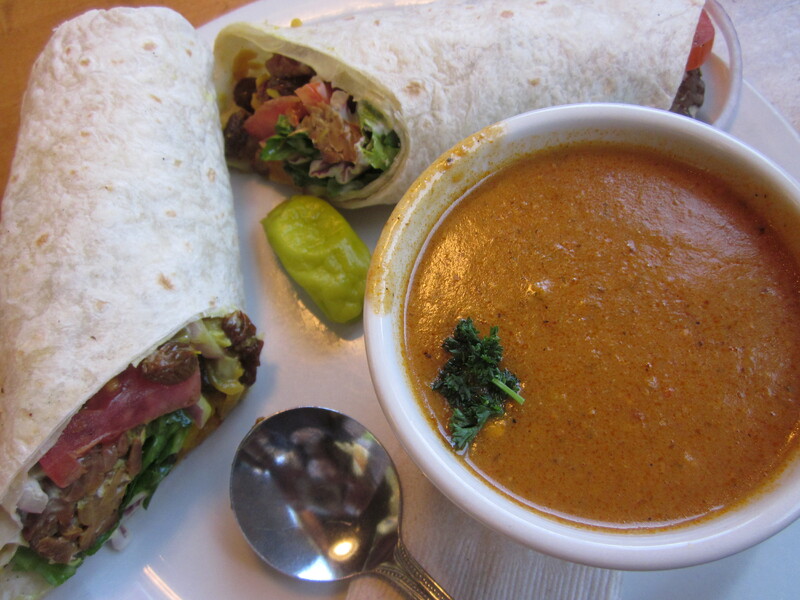 This wrap was positively delicious or as my sister would say, “I was so hungry, anything would have tasted good.” I promise this wasn’t the case and it actually was really good. And really messy. Why do I always end up with sauce dripping all over my hands when I come here? Note to self: do not bring anyone I’m looking to impress here. Tucked away the second half of my wrap for lunch tomorrow then I enjoyed a leisurely walk back to school and passed lots of others doing the same thing. We Boulderites love our physical activity. 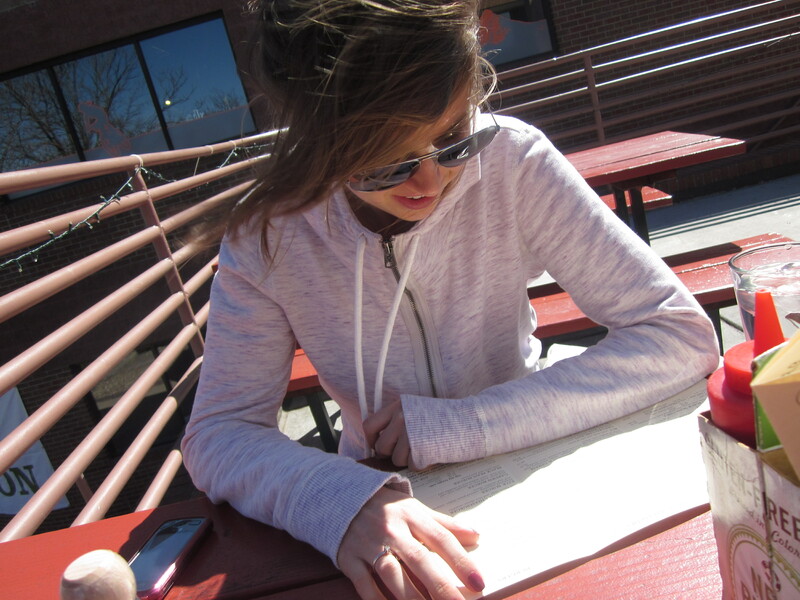 After class, I went home at a quick snack and headed back out for a lovely 4-mile jaunt. I say “jaunt” but it was actually much faster than I have been running on the treadmill lately. I swear that thing slows my pace like no other. There were walkers, runner, bikers and even a scooterer everywhere. Do you live somewhere that makes healthy living easy? Yup, SF is number 2 in selfs healthiest places for women to live. It’s the hills, they shape your toosh, haha. Yeah Boulder!!!! I love how fit and healthy Coloradans seem to be. There’s just something about the mountains and our amazing weather! P.S. Is it embarrassing that I’ve never yet ventured to either Mountain Sun or Southern Sun? I feel like they are practically Boulder restaurant royalty. One of these days, I guess. The menu looks AH-MA-ZING! All the more reason I need to take a road trip to Colorado. It’s always seemed so appealing to me, it’s just so beautiful! yes I love it! my school was voted as one of the top schools for their healthy dining commons….and at home I have alot of healthy foods around me too. Although, I would love living with people who like to eat healthy along with me! Well you obviously know that my cuisine is so not the healthiest! Tuesday Morning is a really neat store. It is sort of like a Marshall’s or TJ Maxx but no clothing. It contains things like pottery, outdoor items, kitchen items, towels, etc. all at dicsounted prices. You can really come across some great deals on pots and pans occasionally. You should check it out! I don’t think Illinois is very healthy. I can’t walk many places in my town! Hey! I’m so glad I just came across your blog!! I loved this! Living in Colorado too, I noticed this last week when we had a day over 50 degrees, it seemed like EVERYONE was out riding their bikes, walking or running. I love colorado!!! We are so lucky.